This classic American steakhouse with a touch of luxury offers a selection of USDA Prime Black Angus beefsteak, all dry-aged on-site for 30-35 days, plus seafood specialties. Angus Club Steakhouse’s elegant dining rooms feature art deco design. 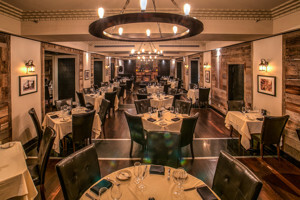 The two-floor restaurant has five private dining rooms available for customized parties and special events—all provide an intimate, elegant, and romantic ambiance.